Savur-Mohyla (Ukrainian: Савур-могила), sometimes transcribed as Saur-Mogila (Russian: Саур-Могила), is a strategic height in the Donets ridge near the city of Snizhne, located about 5 km (3.1 mi) from the border between Ukraine and Russia's Rostov Oblast. The 277.9 m (912 ft) tall hill is better known for a big monument complex that was built in 1963 by Ukrainian architect Anatoly Ignashchenko to the 20th anniversary of liberation of Savur Mohyla during the World War II. It was originally a tumulus (kurgan) – mohyla means "tumulus" in Ukrainian and according to one interpretation the word savur comes from Turkic sauyr, meaning "steppe mound shaped like horse bottom". During World War II, Savur-Mohyla was the focal point of intense fighting, when Soviet troops managed to retake control of the height from German forces in August 1943. 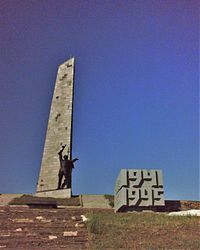 In 1963, a memorial complex was unveiled on the top of the hill to honour the fallen soldiers, comprising an obelisk with a steel-and-concrete statue of a Soviet soldier, four steel-and-concrete sculptures built along the slope leading up to the obelisk (each memorializing infantrymen, tankmen, artillerymen and airmen involved in the battle), and walls inscribing the names of fallen soldiers in the battle. In 2014, during the first months of the military conflict between Ukrainian troops and Donbass pro-Russian separatists, the Savur-Mohyla height was captured by the pro-Russian fighters. On 23 July 2014, pro-Russians forces shot down two Ukrainian Air Force Sukhoi Su-25 (NATO reporting name "Frogfoot") ground-attack aircraft flying at 17,000 feet (5,182 meters) over Savur-Mohyla, using an advanced anti-aircraft system. On 28 July 2014, after intense fighting, the Armed Forces of Ukraine claimed that they recaptured control of Savur-Mohyla from the pro-Russian fighters. However, commander of the pro-Russian Donetsk People's Republic, Igor Girkin, denied Savur-Mohyla had been lost, saying fighting was continuing. Following its capture by the Ukrainian 25th Airborne Brigade on 9 August 2014, the DPR recaptured the hill on 26 August 2014. During the fighting, the hill changed sides between the Ukraine and DPR about 8 times. On 21 August 2014, the memorial's obelisk collapsed after enduring weeks of heavy shelling. A DPR Vostok Battalion flag dedicated to Oleg Grishin's squad called the "Medvedevtsy"
Wikimedia Commons has media related to Saur-Mogila. ^ Two Ukrainian fighter jets shot down as Kiev accuses Moscow of sending more arms to fighters, FoxNews, 23 July 2014. ^ Two Ukrainian military jets shot down over rebel-held area, Washington Post, 23 July 2014. ^ Ukrainian Armed Forces take control of Saur-Mohyla - report to president, Interfax, 28 July 2014. ^ "Ukraine claims more territory as fight intensifies with rebels". Reuters. 28 July 2014. Retrieved 28 July 2014. This page was last edited on 2 March 2019, at 17:14 (UTC).